People who’ve lost all their teeth have benefitted from a solution that’s been around for generations: removable dentures. These appliances have helped millions of people chew and eat food, speak, and smile confidently. But for all their benefits (including affordability) there’s still some things you need to do to get the most out of them like cleaning them daily or having us check them regularly for damage and wear. And, there’s one thing you shouldn’t do: wear them around the clock. Not removing them when you sleep at night can harm your oral health and reduce your dentures’ longevity. Dentures are fitted to rest on the gums and the bony ridges that once held your natural teeth. This exerts pressure on the underlying bone that can cause it to gradually dissolve (resorb). This loss in bone volume eventually loosens your denture’s fit. If you’re wearing them all the time, the process progresses faster than if you took them out each night. The under surfaces of dentures are also a prime breeding ground for bacteria and fungi. Besides unpleasant odors and irritation, these microorganisms are also the primary cause for dental disease. 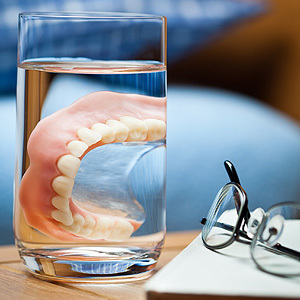 Research has found that people who sleep in their dentures have higher occurrences of plaque, a thin film of bacteria and food remnants that cause periodontal (gum) disease. They’re also more prone to higher levels of yeast and the protein interleukin-6 in the blood, which can trigger inflammation elsewhere in the body. To avoid these and other unpleasant outcomes, you should develop a few important habits: remove and rinse your dentures after eating; brush them at least once a day with dish or anti-bacterial soap or a denture cleanser (not toothpaste, which can be too abrasive); and take them out when you sleep and place them in water or an alkaline peroxide-based solution. Be sure you also brush your gums and tongue with an extra soft toothbrush (not your denture brush) or wipe them with a clean, damp washcloth. This will help reduce the level of bacteria in the mouth. Taking these steps, especially removing dentures while you sleep, will greatly enhance your well-being. Your dentures will last longer and your mouth will be healthier. If you would like more information on denture care and maintenance, please contact us or schedule an appointment for a consultation.